Mirror and silvering combinations are virtually limited only by the imagination . . . you can own a unique, one of decor mirror that no one else could ever replicate intentionally or by coincidence. We can supply a frame from our range, you may already have a frame, or you can have a local picture framing shop make a square or rectangular frame to your particular needs. 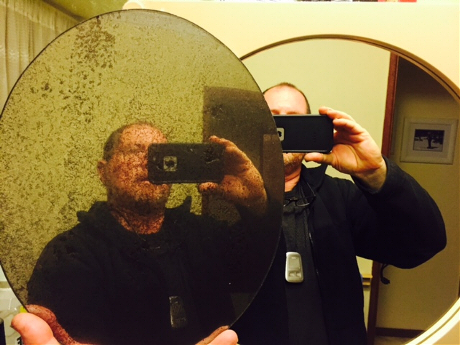 We can even make special mirrors to order in shapes, anything to within certain manufacturing limitations. We can silver your flat or convex glass in a first class new hand silvered finish, very suitable for contemporary design settings. Antiqued silvering is also a specialty, where we make the mirror glass backing look aged and 'spoiled'. This is very suitable for old frames where (for example) an existing broken mirror was already spoiled, and a similar effect is desired in the new glass . . . or if a frame has a dated look (patina), and the clients taste / decor is for an antiqued look, the antiquing the mirror glass lends an air of authenticity to the piece. Below : Antiqued flat oval vs 'good' silver (in the bathroon cabinet) . . .